That’s all there is to it. 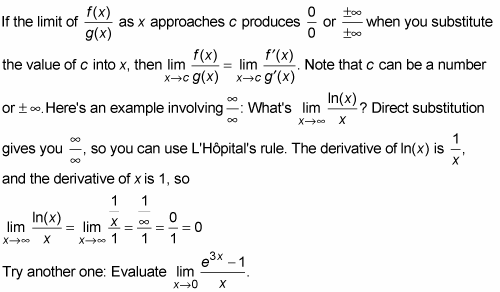 L’Hôpital’s rule transforms a limit you can’t do with direct substitution into one you can do with substitution. That’s what makes it such a great shortcut. Here’s the mathematical mumbo jumbo. L’Hôpital’s rule: Let f and g be differentiable functions. Substitution gives you 0/0 so L’Hôpital’s rule applies. You must get one of these acceptable “indeterminate” forms in order to apply the shortcut. Don’t forget to check this.